CDS Allows You to import a background data file from Google Maps. You need to tell Google Maps a center point in either decimal degrees or a geocoded address (ie street address or similar) . To make use of this feature your job does not need to be in any particular GIS system. The image returned from Google Maps is centered on the point given but the actual scale value is fairly loosely defined. Once particular shot is captured then you are presented with an on-screen method to make the shot fit your data. File Name: Enter a unique name here. The downloaded google map shot is saved with a png extension. You don't need to enter the "png" extension. Latitude Longitude : Enter the value here in decimal degrees. Enter negative values for latitudes in the southern hemisphere. Negative for longitude west of Greenwhich. Address : You can specify a geocoded address here. 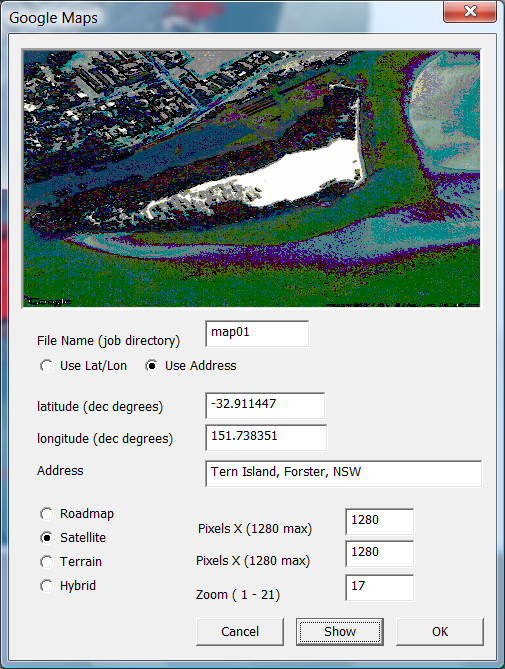 In the example we have Tern Island which is near Forster in NSW, Australia. Refer to google maps for further details if necessary. Bottom left we have roadmap/satellite etc. This sets up the type of shot returned. Whether we want a typical street type map or if you would prefer a satellite type image. You can set the number of pixels in the shot returned. Here they are set to maximum value. Typically you probably wouldn't change these values. Zoom value entered is a value between 1 and 21. 1 would return a view of whole globe. 21 is the highest resolution if available. In the example shown a file map01.png is stored in the current job folder. Once you hit the "OK" button an equivalent bitmap file is stored map01.bmp. This now allows you to make the file fit your data which is now described.